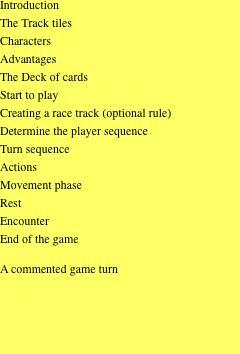 When a player plays a movement card, he/she considers only the number on the card, ignoring all of the other characteristics. The number represents the Movement Points the player can spend to advance his/her character along the path. The characters move by advancing (characters cannot voluntarily go backwards) or Resting (see below). When the character moves, he/she can advance as long as he/she has the necessary phase Points to enter the squares that are along the path. If the character does not have enough Movement Points to enter a square, the Movement phase ends and the unused points are lost. The player can voluntarily use less Movement Points than those that are available. In any case, a square must cost a minimum of 1 Movement Point. Presence of other characters. Entering a square in which there is another character costs 1 Movement Point extra per character. Remember that each square can host a maximum of two characters. If a player has a sufficient number of Movement Points, the squares with two characters can be surpassed. If, at the end of the Movement Phase, the character ends up in a free square or one that is occupied by only one other character, the player stops. If, however, the character ends up in a square that is occupied by two characters, he/she must go back to the first square that can host that character (an empty one or one with only one character).